If the mythic gods of fire had an earthly temple, the Arteflame grill could serve as its baptismal font. Its design, at once primeval and modern, symbolizes mankind’s relationship with the awesome power of fire. Company founder Michiel Schuitemaker, a charismatic, self-described “serial entrepreneur,” developed this singular grill to fill a need: When hosting barbecues, he longed for a stylish but functional grill that didn’t force him to turn his back on his guests. Enter the Arteflame (specifically, the Classic and Euro Series)–a unique combination wood burning grill and plancha. A fire bowl of spun steel—up to 40 inches in diameter depending on the model—sits atop a simple pedestal (available in several heights). Together, they form a raised fire pit. 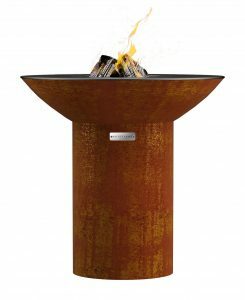 Manufactured in in Cincinnati, the Arteflame uses a special alloy known as COR-TEN (aka architectural steel) that weathers well and requires no special protection from the elements. That’s the same alloy used for outdoor sculptures because the natural oxidation (rust) adds to its strength and visual appeal. A donut-shaped cook-top made of 1/2-inch-thick high-carbon steel fits atop the fire bowl, or in the case of the One Series, the pedestal. Its slightly concave surface allows you to cook foods in their own juices while directing excess drippings toward the fire where they burn off. To control the heat, you move the food closer to the fire pit in the center of the grill, or further away towards the periphery. This allows you to achieve a searing temperature of 600 degrees or a warming temperature of 300. 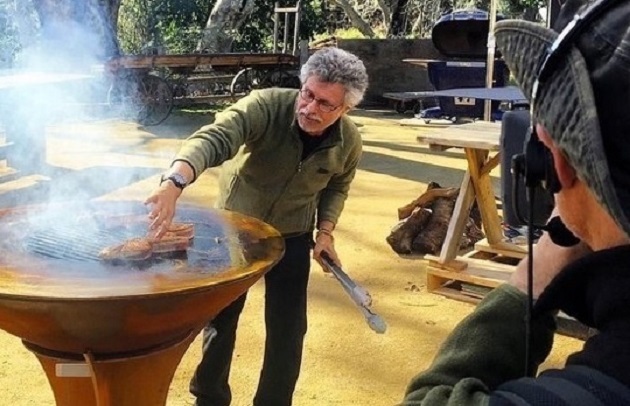 The heat-retentive flat surface of the Arteflame grill top (seen above on the set of Steven Raichlen’s Project Smoke, Season 3) makes cooking on it similar to a griddle or Spanish plancha. The center section is a heavy steel grate positioned directly over the wood fire. Thus, the Arteflame serves as both a wood-burning grill and plancha. To use it, you might put a put a nice sear on a thick tuna steak or beef porterhouse, then move it over the open fire to blast it with wood smoke. Thanks to the Arteflame’s unique construction, flare-ups are a thing of the past. Arteflame recently came out with an insert that allows you to convert your Weber kettle grill into an Arteflame-like grill. Check out Arteflame’s website for details. To get started on the Arteflame, build a brisk fire in the fire bowl. (As with all grills, make sure your Arteflame is level on a non-flammable surface.) Add a lit chimney of charcoal or wood chunks. Add logs as the fire matures. You should be ready to cook in 20 to 30 minutes. Long-handled tongs, spatulas, and heavy duty grill gloves will help you manage the cooking. And because of its circular design (there’s no front or back), the Arteflame is a great grill to get your dinner guests involved in the cooking. To clean the flat-top at the end of a grill session, simply use a wide-bladed metal scraper and push any surface grease or charred bits into the fire. Clean the wood burning grill section with a grill brush or wooden scraper. Season the surface by occasionally brushing it while warm with vegetable oil. Disuse can encourage rust, but unwanted oxidation can be removed with a steel wool pad. Re-season with oil as you would a cast iron skillet. And simply use the Arteflame more often to prevent a recurrence. The Arteflame works great for direct grilling tender, quick-cooking foods such as steaks, chops, chicken breasts or thighs, burgers, sausages, bacon, veggies, breads, etc. The plancha section makes this a great grill for fragile fish, like snapper and sole, that would otherwise stick to and disintegrate on a conventional grill grate. (Hint: When grilling fish, start it on the plancha section to firm up the surface, then move it over the wood grill section to flavor the fish with wood smoke.) You can also cook foods on the Arteflame you don’t normally associate with grilling, like eggs (serve them sunny side up with wood-grilled bacon and toast). The Arteflame is not designed for foods that require indirect grilling or smoking, such as brisket, pork shoulders, whole chickens, turkeys, or lamb shanks. Though in business only two years, Arteflame has already cultivated a strong presence in the world of live-fire cooking. The company is one of the sponsors of Project Smoke 3, which launches Memorial Day weekend on American Public Television. Earlier this spring, the company participated in the NCAA Final Four fan experience by hosting a cook-off for local chefs. (See the video below.) It also aligned itself with one of golf’s most prestigious tournaments, the Masters, and supported chefs, celebrities, and musicians in fighting hunger in America. In a telephone interview, the California-based Schuitemaker confided that Arteflame has produced grills for the staff and players of national sports team, all embossed with the team logo. He is particularly proud of Arteflame’s responsive Customer Service Department and the fact that the small but nimble company can quickly fulfill a request for a custom grill, sometimes in less than a week. That’s impressive in our book. Depending on the model, the Arteflame varies in price, from $850 to $2450. Shipping is free in the continental U.S. 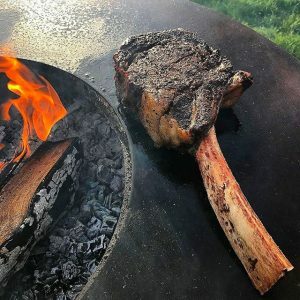 Photos and video by Arteflame Grills.